Imagine what your life would be if you chose actions and an executing strategy that were the highest and best use of your time. 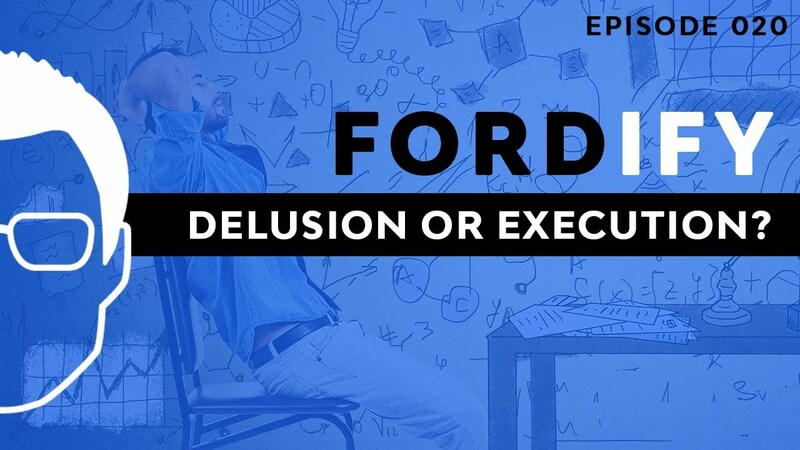 This week’s episode is about idea execution: how to dramatically improve the performance of you and your entire team. Watch the episode below or read the post that follows. 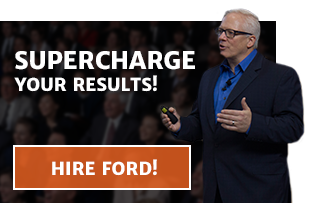 Visit www.Fordify.tv to binge watch the entire season of Fordify! Every Friday I take a box of projects home that I plan on working on over the weekend. Now that’s typical for a business owner. You work more than 40 hours a week. So on Saturday I get up, I go to CrossFit, and I plan on spending the afternoon working. But if it’s nice out, I end up doing something else. Then on Sunday, the same thing happens. I have the best of intentions. I go to CrossFit. I ride my bike. Again, I may work for an hour or two, but I never get as much done as I had planned on getting done on Friday. Then on Monday, I take the box back. Back at the office, I have my ACT CRM system. I have a wall calendar. I have Mindjet. I have white boards. I have Basecamp project tracking and Teamwork, and to do lists, and email, and notebooks, and oh my gosh, I have every tool imaginable. I have an impressive success library of books, CDs, DVDs, and memberships to online training programs. Then I have all kinds of tools to help me be more effective at work for my internet marketing with Leadpages, ClickFunnels, 1ShoppingCart, AWeber, and so many other tools that are fantastic. But you know, there’s one thing that’s most critical to the success of me and your business, and it isn’t a tool you can buy. It’s execution. Which brings me to today’s topic and the fact that most people are delusional, including me, about how much actual time they spend executing versus learning. People spend a ton of time being distracted, procrastinating, or maybe just living in a state of delusion. Here’s an important thing to remember. As soon as you make a buying decision for a resource or a tool, you’ve mentally lost 50% of your motivation, because your brain already thinks you took action. You did take action, but the mini celebration slows you down from actually executing on the things that you’ve learned. This is the same reason why many of the books that you bought go unread. Here’s the problem. Let’s say you want to learn how to play golf. So you watch a video training, or you read a how-to book. But until you actually swing the club a thousand times or more, aka execute, you’re not going to improve. I’m speaking to myself just as much as I’m speaking to you. Most any reason why you “can’t” get started today is really a reason why you “won’t” get started today. It’s a choice, so quit procrastinating and just start. You see, if you’re not passionate, you’re not going to execute. Now one of the ways you can connect to your passion, is maybe you make a dream board. You know, things you want to do, have, or become. Or a goals list, or a check list. But I want you to connect to what really drives you. It’s easy to get shiny object syndrome and jump from idea to idea. Before you commit to executing on an idea, make sure that it aligns with your long term and short term goals. Done is better than perfect. You need to keep it simple and just get going. Either use a report, an app, a wall calendar, or get an accountability buddy. But you need some way of actually measuring the action steps. Not just how many books did you buy. What are you going to do to celebrate? I recommend doing small celebrations. Maybe you spend the night in a hotel, or you get yourself a treat, or you get to go to a movie, or you do something special that you and your team really likes to do. There’s all different ways to do this. So here’s your action step for this week’s episode: Pick one thing you know that would really make a massive impact on your life, but you’ve been just putting it off. And then I want you take massive action, and execute to move it forward today. Posted on September 13, 2017 in Leadership by Ford Saeks.